Dallying In The Dirt, Issue #242--- These Cactus are a mass of indoor blooms. 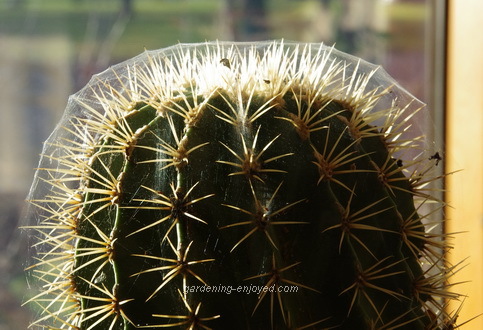 The sun shone through the solarium Saturday morning and lit up this cactus and its winter coat. Without the bright sun the very fine webbing covering its top half is almost invisible. It had been part of that day’s plan to move some of the part time houseplants to their more permanent home. The Assistant Gardener was beginning to question the necessity of having two, large, very thorny, Cactus on the kitchen counter. Luckily the morning’s bright sun revealed the rather pretty, but unwanted, webbing before I moved the Cactus up onto the top of the cupboards where they will spend the winter. It went into the sink and some nice tepid water was applied with the faucet’s sprayer until the webbing had all but disappeared. It, of course, didn’t wash off but rather clumped up and hung on to the thorns. A wooden skewer was repurposed as a cleaning tool. I wasn’t about to put my fingers in between those thorns. As I was completing the removal of the webbing and a few stray bits of leaves etc. that had come inside with the plant, I discovered the culprit. A small yellowish spider was scampering over the thorns wondering where all his efforts had disappeared to. I was happy to see him because it confirmed that the webbing didn’t belong to those nasty Spider Mites, the scourge of all indoor gardeners. I found him a new home outside, wished him a happy winter and moved the clean Cactus to its winter home. Upon doing that I discovered that the three Colocasia that were already up on those cupboards were providing homes for a nice collection of Aphids and possibly a few Spider Mites. I contemplated fighting with those invaders all winter and then moved those plants outside where that night’s freezing temperatures eradicated the bugs, the plants and any thoughts I had about overwintering them. Keeping with the Cactus theme, this beauty was moved down from the high solarium shelf to a place of prominence on the kitchen island. 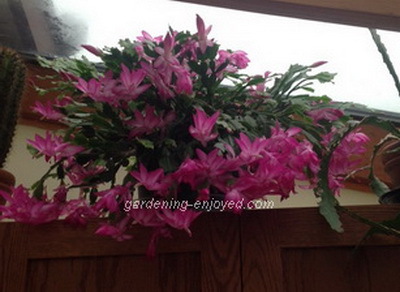 It is a Schlumbergera spp. a small Cactus genus of about six species. They are widely grown as houseplants because of their prolific flowering. I have two large plants. This one is known as the Thanksgiving Cactus for its ability to reliably bloom on the American Thanksgiving. There are a few colours in the red, pink, orange range that are available as hybrids of this species. My other plant will be along in about a month as it blooms reliably at Christmas time. Both of these plants are quite easy to grow and bloom. They are short day plants, their bloom cycle is initiated when the daylight hours are fewer than the dark hours. The number of short days to initiate flowering is obviously different for the two species. Their flowering may be inhibited by artificial light that extends their daylight hours. Mine both live on upper shelves in the solarium where little or no artificial light ever disturbs the natural rhythms. When the days are frost free in the spring they both move outdoors to a shady location and receive a haircut on the way there. Typically I remove about 1/3 of the growth and most of that has regrown by the time they move back indoors before the first frost. They do get regular fertilizer when they are outside but almost never once they move indoors. Like most Cactus they enjoy being well watered but not often. They would be easy to kill with too much water during the winter but I know that I have neglected them for a considerable period of time with no ill effects. I often write about the results, good and bad of my procrastination. 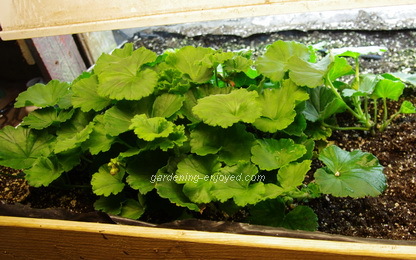 These Geranium cuttings were placed in this propagation bed sometime in mid September and were kept regularly watered. They were well rooted enough to pot up, some time ago and it was my intention to do so, on a day when the weather was too nasty to work outside. We had a lovely long warm autumn and now I have these rather healthy but overgrown Geraniums fighting for space in that propagation bed. I did dig them up and give them individual pots after I took the picture. Several had some nice blooms on them which I removed to help them make the transition. The roots on these cuttings were amazing, some growing half way across the propagation bed. A little root pruning was necessitated but the potted plants seem to be doing very well under the lights in the basement. They will be back in bloom in a couple of weeks and their care will keep my gardener’s soul content through some of the short dark days of winter. Actually we are now less than a month away from the shortest day and then our gardening dreams can grow with each lengthening day. Sharon Asks? I have a small fig tree purchased at the local Zehrs which thrived quite well outside all summer. However I am not sure how to care for it over the winter. Last year I brought it indoors as it quickly dropped every leaf but then kept buds with little growth. Once back outside in the warmer weather it returned to it's former self without much overall growth. Can you improve on my attempts? Ken Answers! Sounds like you are doing the right thing. I have a friend who is the cold climate fig expert,, here's his web site. Check it out and learn more than you ever wanted to know. Vivian Asks? Will hosta survive being in a medium/large outdoor container? I divided hostas this year and didn't know what to do with one, so I just stuck it in a container. It looked great all season, but now it is still there...leaves dead and removed...with an upside-down container over it and covered with a plastic tarp. Will it survive the winter? I was too lazy to dig it out to give it a place in the ground. Ken Answers! Hosta are pretty tough so you've got a reasonable chance of having it survive in that container. If it does you are ahead by one Hosta, if not, then you had a great container for a season so you are ahead in any case.